A Talon rear sprocket for the later Sherpas 1975 on fitted with a 520 chain size. This is available with 39, 40, 41 or 44 (+£3.78) teeth, please choose from the dropdown. 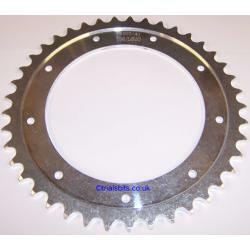 This sprocket has nine 6mm holes all drilled equidistant. The internal diameter is 14cm, and the brake recess has a diameter of 18cm.